The Sophomores warm up by throwing the ball back and forth for the second day of tryouts. Teams will be announced tonight. The boys baseball team will begin to suit up for tryouts during this week. The coaches of all three teams which consists of the sophomore, junior varsity and varsity teams will evaluate the players all week. Players are mainly evaluated on hitting, exit velocity, speed, fielding, and for some, pitching. Lead by Jason Mihalakis, head coach, the Royals will look to create a well rounded roster to help them win their section and move on to state. The Royals missed the opportunity to go to state by losing in the section finals last year to the Wayzata Trojans in a walkoff loss. “We look for versatile athletes that have great work ethic and exceptional sense of the game. We love players that are hard-nosed, competitive, thrive under pressure and make everyone better around them,” Mihalakis said. The tryouts are going to last from Monday till Saturday. Each day will have different evaluation drills. Tryouts for the freshman team happened last week and the teams will be announced towards the end of the week. Monday consisted of hitting drills such as exit velocity and hitting power. 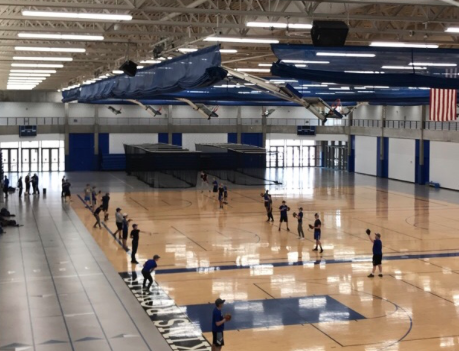 Players were also evaluated on running a 60 yard dash to test running from base to base speed. Finally, they finished with various fielding drills for outfielders and infielders. Tuesday tryouts consisted of four different activities for the junior varsity and varsity hopefuls. Pitchers started the practice by throwing in the bullpen while the rest of the players received batting practice from the coaches. Finally infielders went through different situations at their positions while outfielders worked on reaction times. Wednesday and Thursday were very similar to Tuesday’s tryouts. Players did some infield and outfield throwing. They also did some batting drills and pitchers did some pitching drills in the bullpen. Tonight will be final evaluations and the coaches will make final decisions on the varsity and junior varsity teams. Although tryouts are just the beginning, the players and coaches will look to achieve their goals for this season.